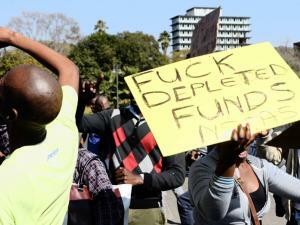 Unisa has expressed shock last week at protest action at their campuses over the depletion of NSFAS funds. NSFAS (National Student Financial Aid Scheme) which provides loans, especially for those students in need, announced that its funds were depleted. Student strikes started in Pretoria after crisis talks on Wednesday, 17th July. By Friday UNISA registration was being disrupted, and the registration period eventually extended by UNISA. Unisa registration has been extended a second time, and ends on the 24th of July. As unhappy students embarked on strikes at Unisa campuses they caught Unisa authorities unawares, who later stated that they only found out about the strikes through the media. UNISA also stated that various other financing sources has been found, but that they were already depleted earlier in the year. UNISA has now agreed to pay the fees for returning students themselves. This has thankfully ended the strike action, but has left new students disgruntled. Students who were on the strike feel that UNISA only stepped up due to the strike action, and that therefore the strike was both necessary and effective. On the other hand some students recall the terrible disruptions caused by strikes last term, and were angry that the strikers hold their fellow students studies to ransom in order to demand action from the university. They also feel that the strike should have been aimed at NSFAS, not UNISA. Whatever the reason for the shortfall, and whichever side is right all I can say is: THANKS GOODNESS UNISA STEPPED UP!! A full strike has been avoided, and studies only minimally interrupted. We recommend that all students register as per normal, and then enquire with Unisa as to the status of their funding. Students should note that the 31st of July deadline for payment of fees still applies, and that all enquiries regarding NSFAS and their fees can be made at NSFAS staff at Unisa, as well as the accounts department. 0 Responses on Unisa eases NSFAS registration blues"